A cowboy from the Great Basin country of northern Nevada, southern Idaho, northeast California and southeastern Oregon. Often wear flat hats, chinks, and ride A-fork saddles with post horns and bucking rolls. Traditionally their gear displays lots of silver and is fancier than some other areas of the country. Buckaroo gear and style of handling horses is becoming quite popular in other parts of the country and the world. CHARRO: Gentleman rider of Mexico. 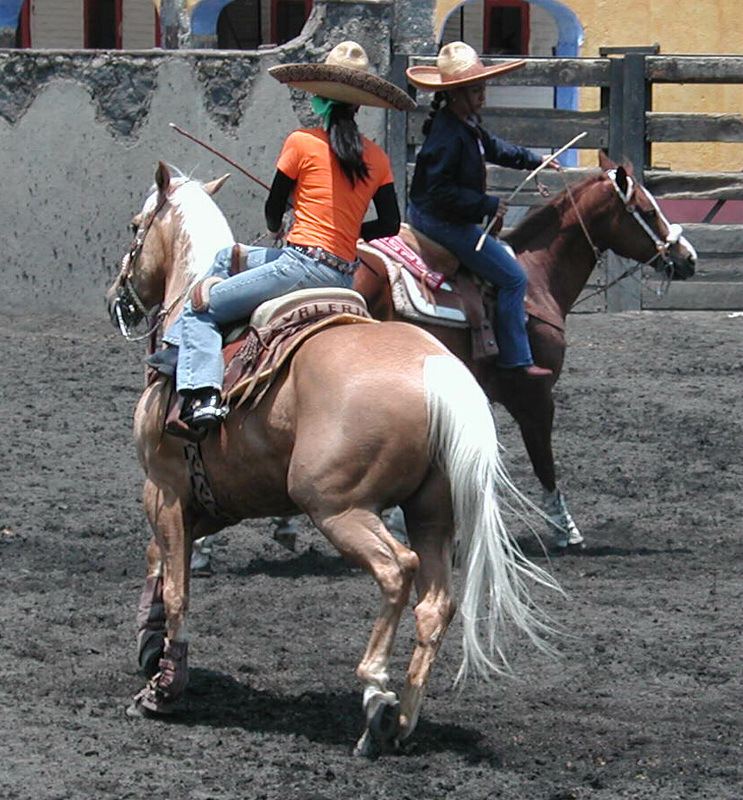 Charros often exhibit a very flashy style of riding and use ornate dress and gear. 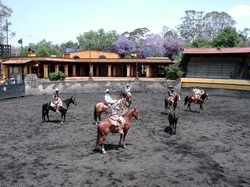 Jalisco and Guerrero are the main states in Mexico where the charro tradition originated. 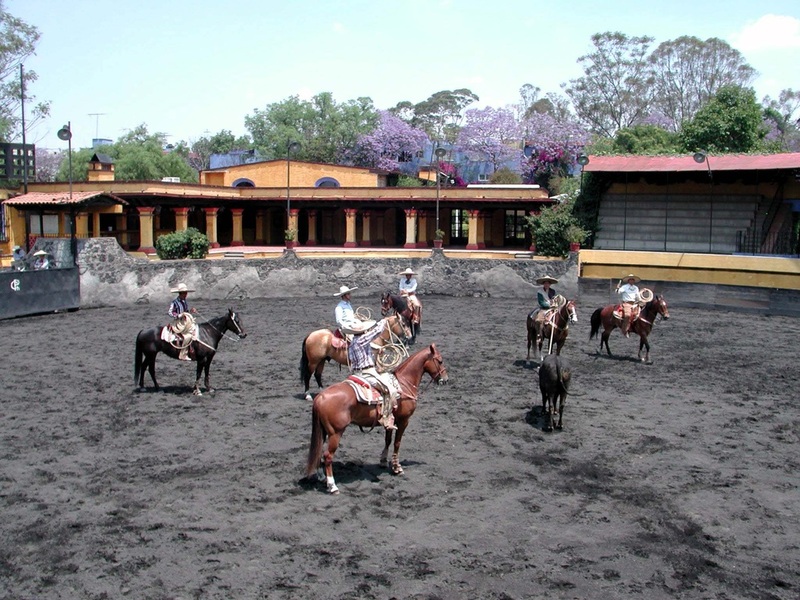 CHARREADA: A gathering of charros combining skilled riding, roping, and bull tailing, somewhat similar to a rodeo in the United States. ESCARAMUZA: Women participating in a charraeada as a drill team, riding sidesaddle. CIRCLE or BIG CIRCLE RIDERS: Cowboys start at a point designated by the cowboss, ride widely-separated, gather the cattle, and push them to the holding or	rodear grounds where the cattle will be worked. COWBOY: A person, in the western United States, who tends cattle and performs many of their duties on horseback. COWGIRL: We prefer the term female cowboy and the term cowboy, as used in this site, refers to both genders. COW BOSS: In charge of the cattle operation on a ranch. They choose where the cowboys will ride and hire and fire cowboys. Answer to the general manager. 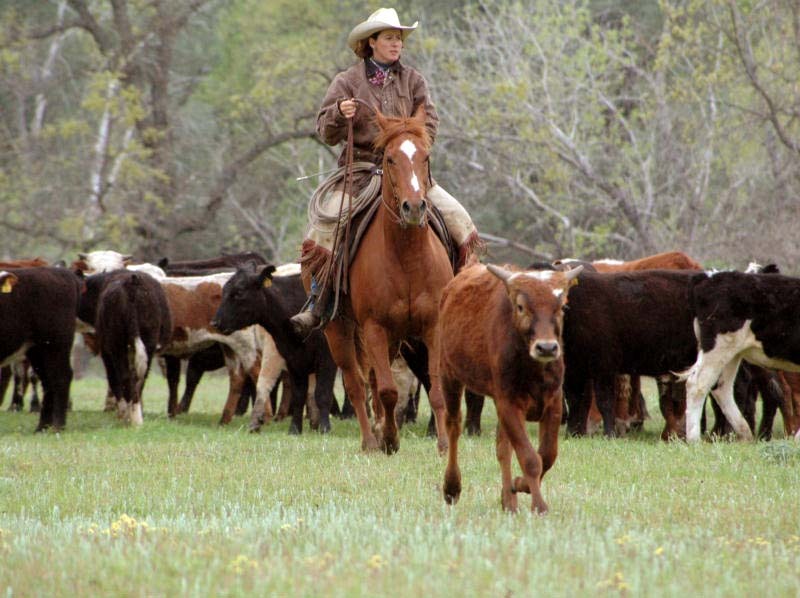 COWMAN: A ranch owner that makes a living raising cattle. COW-PUNCHER:	Also called Buckaroo, Cow Poke, Waddie, Cowboy, and in Spanish a "Vaquero". Terms for cowboy vary with the region. 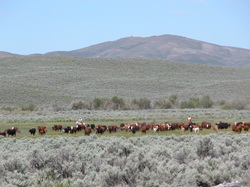 The term cow puncher or "puncher" is more commonly used in the southwest. DROVER: Term commonly used in the 1870s and 80s for a working cowboy engaged in trailing longhorns to market or a new range. 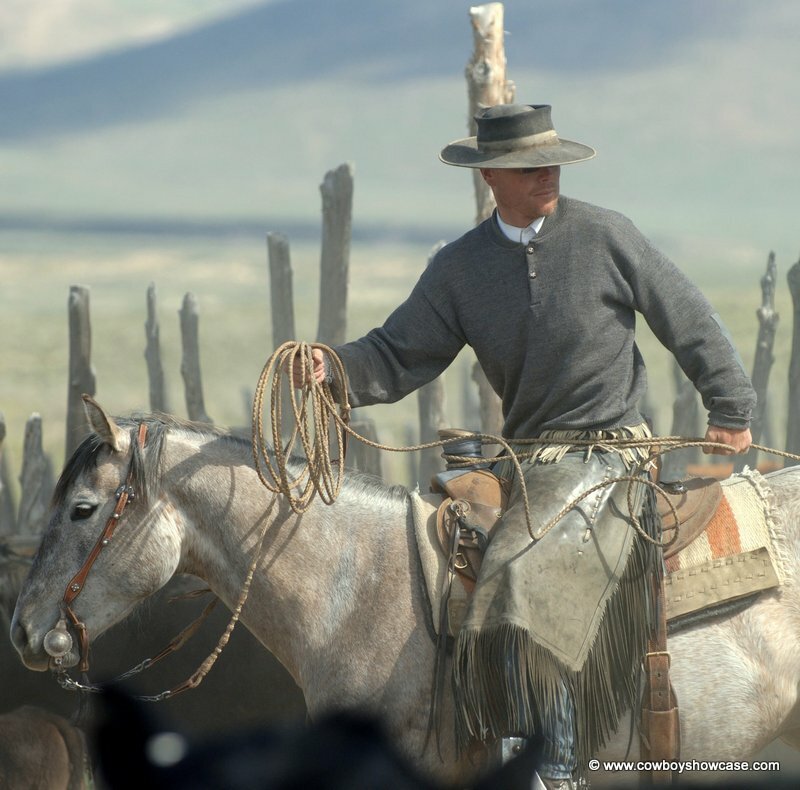 VAQUERO: Spanish term for a man who takes care of cattle. Mexican cowboy. From the Spanish word "vaca" --meaning cow. WADDIE: Another term for cowboy, a hired man, in the western United States, who tends cattle and performs many of his duties on horseback. The term “waddy” is an old term that no one seems to be able to actually put their finger on the exact origin. It is more common in the Midwest and Southwest. Saddlemaker Mike Brennan did research with these results. "It originally was a very derogatory term and meant a thief or rustler, then evolved gradually into a lower class “hired man on horseback”, and finally came to mean a top hand. My grandfather carried the nickname “Waddy” from the time he was a little sprout until the day he died, in fact most people didn’t even know his real name. Apparently both spellings of the term “waddie” as in Waddie Mitchell, were and are correct with some sources listing waddy as preferred, and some listing waddie as preferred. " 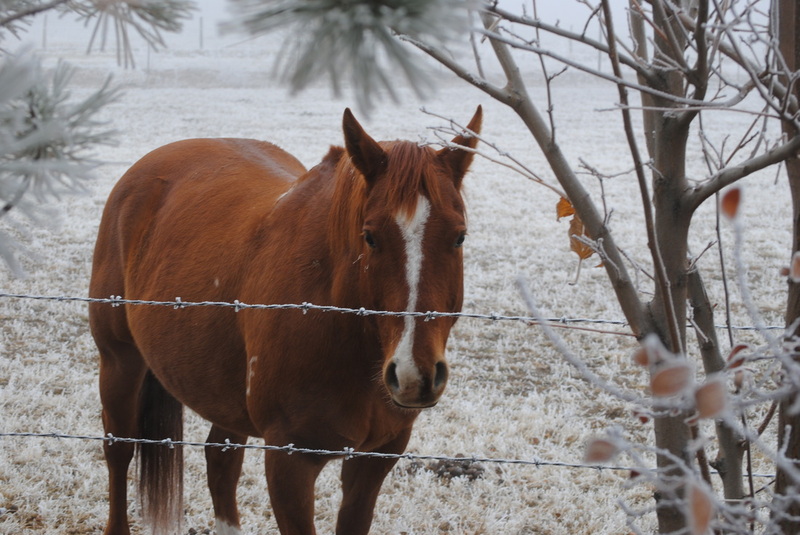 ​WHITE COWBOY: (or white buckaroo) Our friend, artist and cowboy Denise Smith says, "Snow....we call it the 'WHITE COWBOY' who comes and you can find the rest of the remnants in the mountains....it also brings them home .... most of the time!!!" GUNSEL: A person with limited knowledge of livestock and cowboy ways. Usually used as a derogatory term. GYP: A female dog - term used especially in the south. SHOER: Farrier, horse shoer - a person who attaches the iron shoes that horses are provided with to protect their hooves in rocky ground. The shoes are shaped and nailed to the hooves. 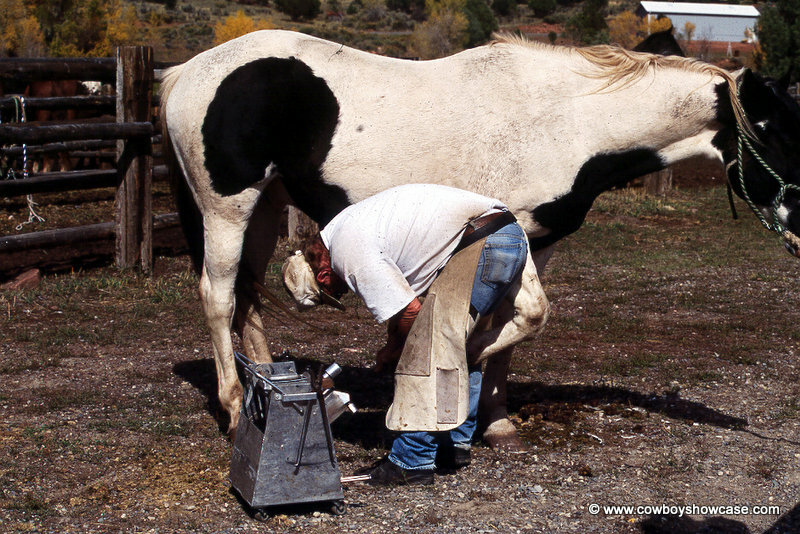 It is said that the invention of horse shoes was one of the large steps leading to the industrial revolution. Horses could go farther and longer with less injury and lameness. FORKED: (pronounced fork-ed - like the name Ed) Adjective applied to a Cowboy that can really ride a bronc well. POGONIP:	(PAH-guh-nip)	Paiute word for cloud, referring to a dense winter fog containing frozen particles, formed in valleys in Western United States. Also called white cloud, white death or death fog. Formed when humidity is 100% and temperature falls below freezing(32° F.) The ice crystals will then settle onto surfaces, forming beautiful ice crystal sculptures. Beautiful but dangerous. 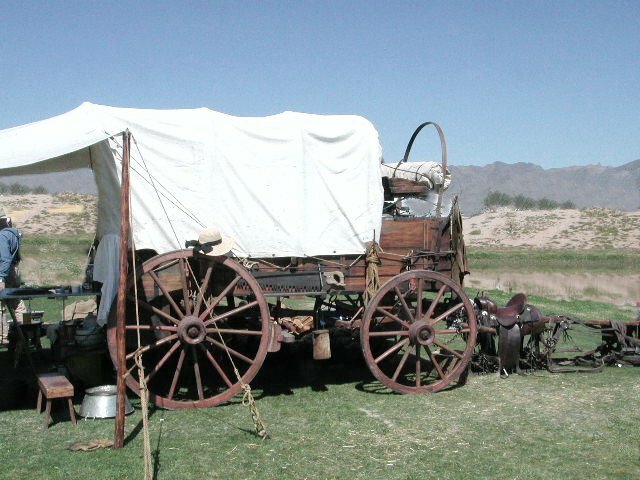 WAGON: A chuck and a bedroll wagon goes out with the cowboys when they work cattle on the range for several months at a time, especially in the spring and fall. Candy wagon: a vehicle that hauls the grub and supplies to line camps. 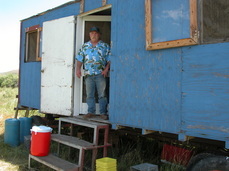 CHUCK WAGON COOK: also sometimes called "coosie", or "cookie." COCINERO: Spanish term for male cook or chuck wagon cook. On the old time cattle drives, the cook was sometimes an aging cowboy hired for his ability to drive a wagon more than his cooking skills. He was in charge of the wagon and everything related to it. The cook was paid more than the other hands because the success of the camp and the drive depended greatly on him. A cowhand earned about a dollar a day and the cook made twice that. Ranch cooks today still command a great deal of respect and many expect a certain strict etiquette in their vicinity. HOODLUM OR LITTLE MARY: Cooks helper-chops wood, peels potatoes, does dishes, and other chores around the chuckwagon. JIGGER or JIGGER BOSS: Second in command to the buckaroo boss. 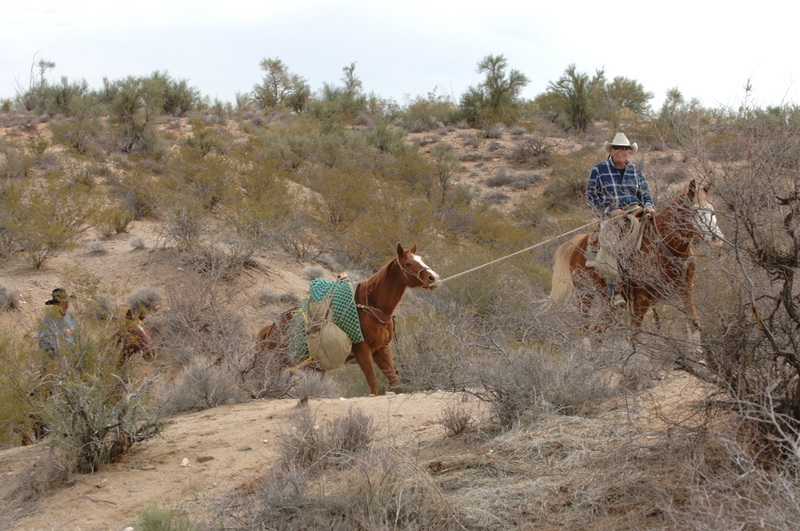 Often ropes the buckaroos' horses for the day. 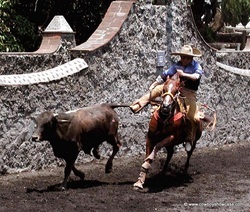 LEAD RIDERS: Two cowboys that ride on each side of the 'lead steers' in a trail herd. They push the cattle in the general direction they want the herd to move. DRAG RIDER: Cowboy following the herd pushing the stragglers. NIGHT HAWK, NIGHT HERDER	: Cowboy that constantly rides around the cattle herd at night. (NIGHT RIDER)Sometimes used long ago to refer to someone on the "dodge." NIGHT WRANGLER : A cowboy that herds and cares for the saddle horses during the night. POINT RIDER: Cowboy who rides in front of a herd and provides something for the animals to follow. FLANK RIDER: Cowboys riding along the sides of the herd keeping it bunched. RANGE BOSS: Manager of a cow outfit out on the range. RANAHAN: Top cowhand, sometimes shortened to "ranny." REP: A representative. 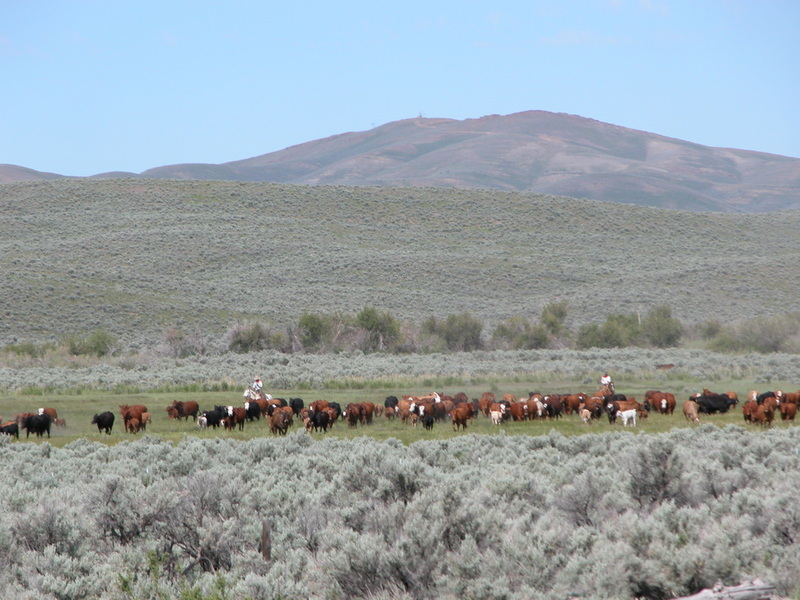 In the old days, neighboring ranches would pasture in ranges without fences as we know them today. During roundup time, representatives from neighboring ranches would attend the roundup. 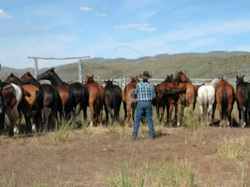 A rep with his own string of horses would trail to the range and ride and work with the roundup crew. When the cattle were gathered, those with his ranch's brand would be cut out and the rep would trail them home along with his saddle and pack horses. 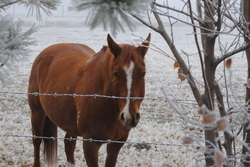 ROSIN JAW: Hired man that does the mechanical, irrigating, and feeding chores on a ranch--all the non-horseback work. One of the "ranch crew." May be a regional term common to the Great Basin. RUSTLER: A horse or cattle thief. SHADOW RIDING: A cowboy that rides along, admiring his own gear and his own shadow. SWING RIDERS: Are the cowboys that ride the sides of the main body of the trail herd keeping them together and keeping them moving. 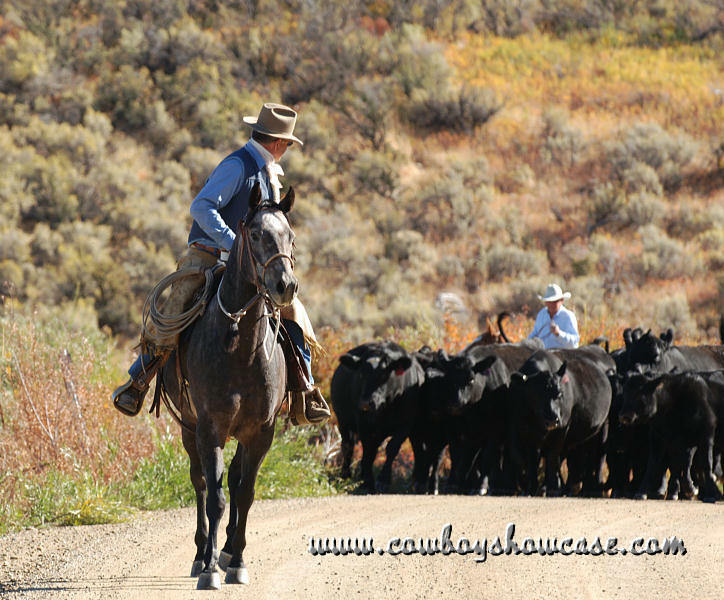 TAIL RIDERS: also "DRAG RIDERS" Cowboys that follow the trail herd and keep the cows and young calves moving. 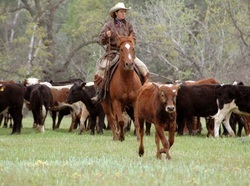 TALLY-MAN: A cowboy that stands beside the branding-fire at a round-up and makes a tally mark for each animal branded, ear-marked, and vaccinated, showing to whom it belongs. A tally-man can also count animals out a gate and keep track of them. 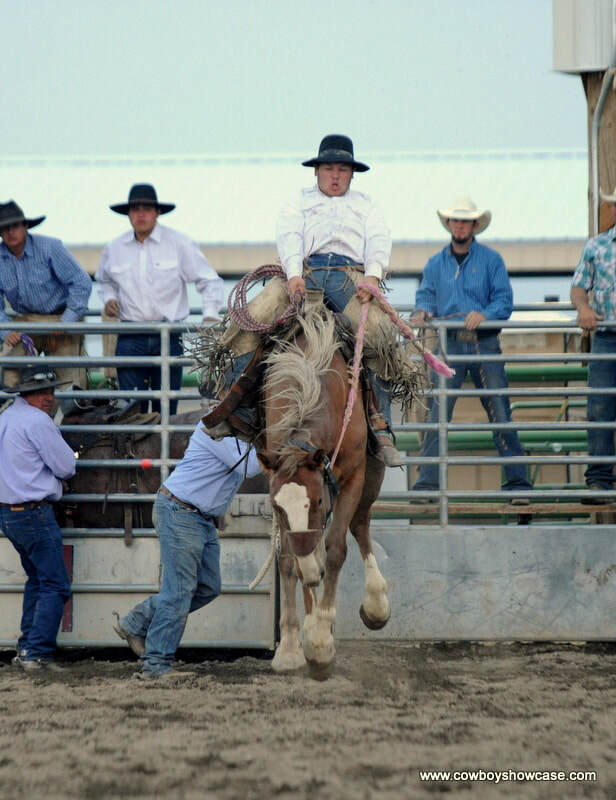 TIE-MAN: A cowboy roper that ties the end of his rope to his saddle horn while roping horses or cattle. Regional roping technique used mainly in Texas, some in New Mexico and Arizona. SCRATCHED: Drawed out of a bronc riding (not allowed to compete) or a horse that has been removed from a race due to an injury or something similar. SHADED-UP: Can be applied to cowboys, cattle, or horses--Pulled into a shady spot to rest. "SEARCHING FOR THE ELEPHANT" going over the next hill, looking for something that is never there. Sums up the philosophy of many cowboys who travel from ranch to ranch always looking for new horses to ride and new country to explore. Like a friend said, "Cowboys are always going somewhere." SHEEPCAMP OR SHEEP WAGON: During earlier years in the American west, millions of sheep were grazed on the rangelands. 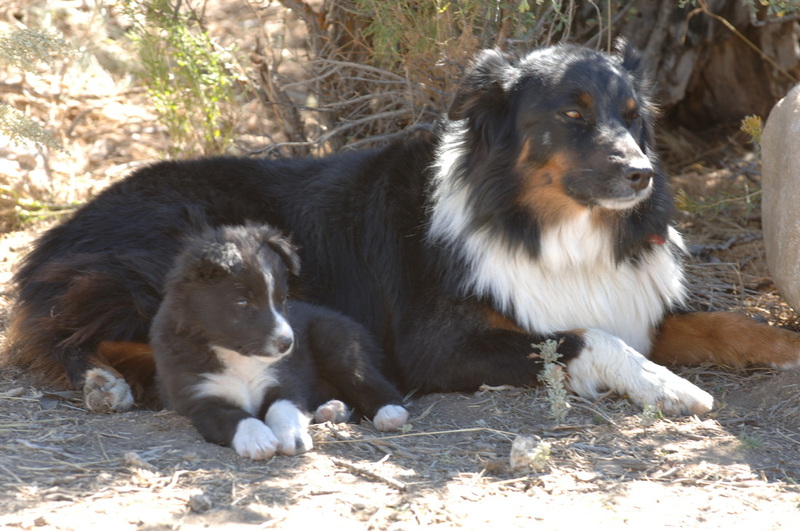 A lone herder and his dogs could tend a couple of thousand sheep. The sheepwagon was the herder's mobile home as he followed these bands. See the complete article. 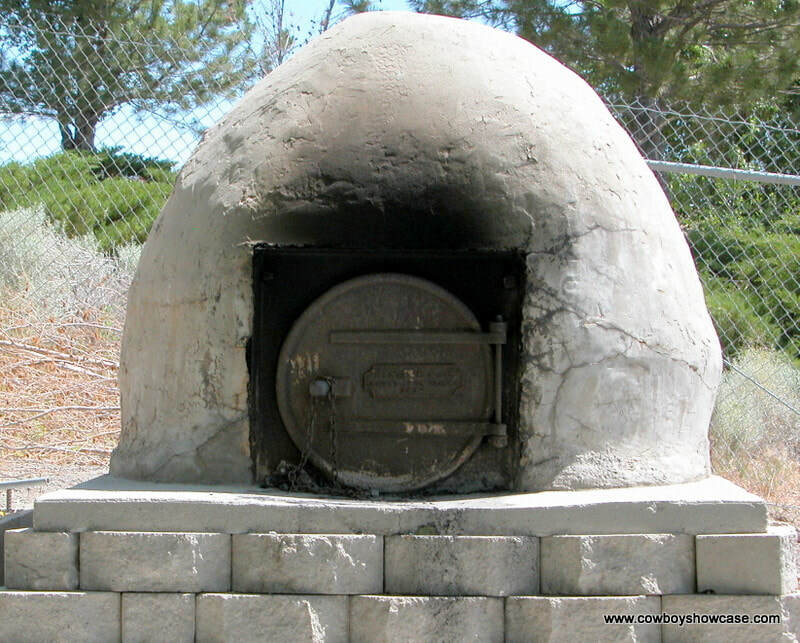 A Basque sheepherders' bread oven​ is on display at the Elko Basque House. This and similar ovens were used by early Basque sheepherders and camp tenders at main camps to bake bread like they made in Spain. Basque bread was among the provisions that tenders would take to the sheepherders every five days or so. On their own, the shepherds baked bread in a Dutch oven in a hole they dug in the ground. These holes can still be found up in the mountains of Nevada and California. 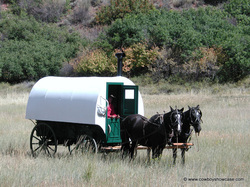 See articles on Basque Ranching and Dutch oven cooking.